^ World Meteorological Organization World Weather / Climate Extremes Archive. [10 January 2013]. （原始内容存档于2013年1月4日）. ^ Find Distance and Azimuths Between 2 Sets of Coordinates. Federal Communications Commission. [2010-08-13]. ^ Celeste Cosby; Jeanette Hawkins; Jani Kushla; Molly Robinson. Boron Minerals of Death Valley. Clark Science Center, Smith College. 2009. （原始内容存档于2008-03-17）. 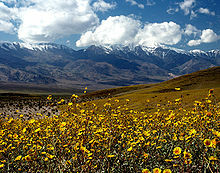 ^ Weather and Climate Death Valley National Park (PDF). U.S. National Park Service. July 2007 [2009-04-16]. ^ 6.0 6.1 Weather and Climate. Death Valley National Park. U.S. National Park Service. 23 May 2008 [2009-04-16]. ^ National Park Service. Weather and Climate (PDF). Death Valley. NPS.gov. [2009-05-29]. ^ WRCC. Monthly Climate Summary. Desert Research Institute. [2009-06-08]. ^ NOAA. 1981–2010 US Climate Normals. NOAA. [2011-07-25]. ^ WRCC. Western U.S. Climate Historical Summaries Weather. Desert Research Institute. [2009-06-03].